"Attici Amoris Ergo" Artist Yuen Fong Ling will lead a workshop/discussion/performance twisting the traditional life class format to reconfigure the artist's model. Responding to the National Heritage site Rufford Old Hall in Ormskirk, Lancashire, the artist as the model will be working with members of LAN (Lancashire Artists Network) in the Great Hall where it is believed that William Shakespeare had once performed. 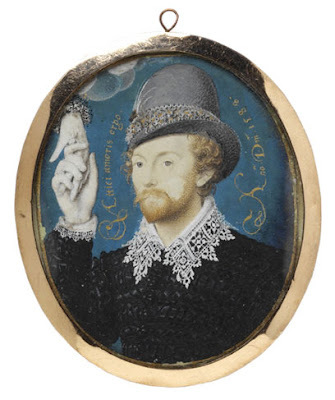 By re-staging the life model set-up for Nicolas Hilliard's "Portrait of an Unknown Man Clasping a Hand from a Cloud" 1588, also believed to be connected with the young Shakespeare, the event aims to transpose the mythology of the portrait, through the artist as model, to speculate upon the creation of the myth. Rufford Old Hall, 28th June 2008, 11am-3pm, standard National Trust Entrance Fees apply, to participate member of the LAN need to book by email to: mail@celia-cross.co.uk. This event is supported by MAP.